Today is the beginning of a four week quilt along for Autumn Jubilee!! This will be a two block quilt, so you can do just a few blocks for a table topper, or a lot of blocks for a quilt. I’ve been sewing like mad lately, and got a really good head start on the project at the recent Quilt Retreat. Some of the pictures of construction are from those days, I was really productive!! I am making a larger quilt, with 10 “A” blocks, and 10 “B” blocks for a 20-block quilt. This is part mystery, so you won’t get the whole design until week 3. Quilt alongs posts will appear every Monday for four weeks. Last year we did 6-inch blocks, and I thought this year we’d go big in a hurry with 12-inch blocks. It isn’t Autumn without pumpkins, so here we go! Gather some pumpkin fabrics for a big and easy block that goes together quickly. Begin by sewing together the six pumpkin strips. I sewed these at retreat on my little portable machine. Having a big mug of coffee helped make the early start more enjoyable. I really had a great time, sewing with friends and making good progress at the same time. Lots of chatting went on too! On the background squares, draw a diagonal line from one corner to the opposite corner. Place the squares on the corners of the pumpkin strips. Sew on the line. The squares are larger than the strips, and will cross over one and a half strips to make the perspective right. Trim to a quarter inch seam allowance. Press the seam to one side, or open as you prefer. 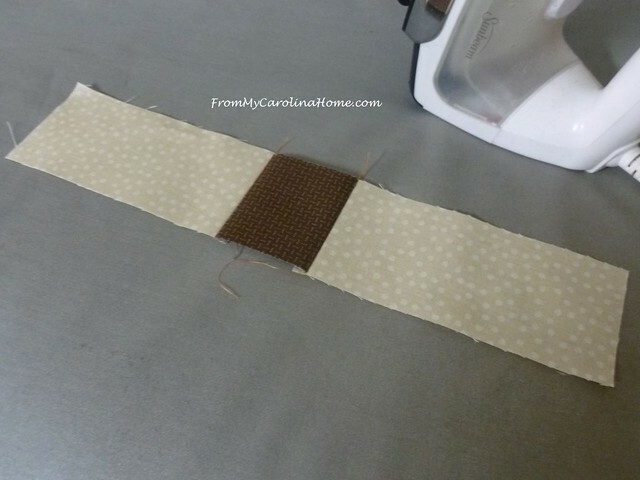 Sew a background strip to each side of the stem square. Sew the stem unit to the pumpkin unit. I know many of you out there believe I can’t think in terms other than autumn colors, LOL, but here’s an idea to prove I can. This alternate colorway has a white pumpkin on a black background, and is my idea of putting a bit of a modern edge to a traditional look. You can make your pumpkins any color you choose. Multiply the number of pieces for one block by the number of blocks you want to make, I did 10 pumpkins. The blocks will be 12-1/2-inches at this stage so you can figure the size you want. Four blocks – two A and two B (next week) – would make a 24-inch square table topper. Today’s Giveaway is from Madam Sew! This 32-piece set fits almost any machine with the adapter that makes it possible to use the snap-on feet. I have used feet from this set on all four of my sewing machines made by Pfaff, Janome, Kenmore and Brother. 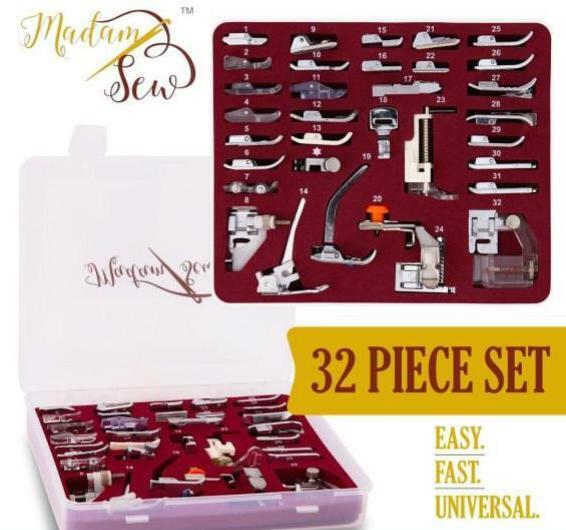 It is wonderful to have just the right thing when you need a specialty foot for free motion quilting, accurate piecing with the quarter inch, paper piecing with the open toe, and lots more. Madam Sew also has a blog, with lots of good information and fun projects. I’ve written a few posts for them, and have more coming up soon, including a fun Christmas project. I have quite a few Madam Sew products, and they are all high quality. To enter the giveaway, leave a comment on this post, then click on the Giveaway button to go to the rafflecopter entry page. Open to International entries too!! The more you do, the more chances you get. Extra entry today for blogging about Autumn Jubilee this week between today and Sunday. Entries close this coming Sunday the 14th at 11:59 pm. Update, Block B is posted!! Click HERE. Do you like the pumpkin block? What new foot would you say you need the most? Happy Thanksgiving to my Canadian Readers!! 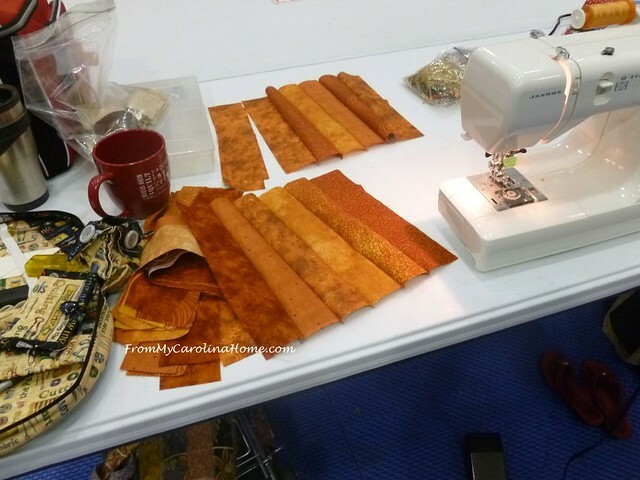 Share your Autumn Jubilee Quilt Along progress on Flickr in our group From My Carolina Home Project Sharing on Flickr , or share in our facebook group – From My Carolina Home Project Sharing on Facebook. Please comment on each other’s shares too, being a part of the From My Carolina Home community is fun! See what is new on sale with the Fat Quarter Shop’s Daily Flash Sale! FQS Basic of the Month is 20% Off Uncorked Metallic by Windham Fabrics. FQS Notion of the Month is 25% Off Happy Cloud Batting. Aurifil Threads and Hobbs Batting on Sale at Craftsy! New Kits on Clearance at Craftsy. love your colors and pumpkins! For some reason, I love making pumpkin blocks! Favorite color, easy to do, & NOW my daughter has gotten into blowing glass. You guessed it – she is now making glass pumpkins to sell @ their annual Glass Pumpkins Patch this coming weekend. Oh it is a sight to see! All shapes, sizes, colors. . . they work on this fundraiser all year. One year they made 905 & sold all but TWO in the hours 10 to 3. She started with just the stems, & how gloriously curly they were, passed those on to someone else experienced in making the p’kin part. . . The sale is outdoors on their Courthouse lawn, arranged on & around hay bales & shade trees, with sun glinting on all those glass gourds! NOW they’ve opened a local hot shop with the proceeds, so won’t have to travel an hour each way to create. Google Bloomington, IN Glass Pumpkin Patch event to get a gander. Now I feel the need to give her a table runner of pumpkins! Orange is my favorite color. These pumpkins made into a bed sized quilt for the season are tempting me to start another project. Since turning 75 I decided to enter the craft show where I live in Florida….Making several table runners has been one if my favorite vthings to make. Simple design. Why not use the colors of the many varieties of apples? Perhaps turned into placemats? Love the pumpkin blocks, I picked up a box of scraps the other day and used up all of the orange for some impromptu pumpkin blocks for pot holders and mug rugs. What a fantastically fabulous way to use scraps! You have inspired me to make an autumn quilt. I do like the alternative colorway but will go with traditional colors. Always looking for new gadgets to make qulting quicker, I am sure there is a foot or two that would be very useful! The pumpkin looks easy to make. I would like to try the roller foot and learn to sew bindings on by machine. I’m a nut for fall, too! Carole, I think your blog just keeps getting better and better, and really enjoyed the book reviews yesterday. As an avid ‘listener’ of audio books, I am always looking for other people’s reviews, so I will continue to check out your Book app in the sidebar. Your pumpkins are adorable and while they will make up great looking runners, placemats, quilts, etc., I have a hard time liking the squared off ones, and prefer to applique pumpkins with rounded edges. Guess my age is showing. Love the pumpkins, thank you for this fun project. I love doing your quilt alongs and am looking forward to this one. If I could have one foot I would like a 1/4 inch foot. I just started trying to free motion quilt on my home machine. It’s not going very well so maybe there’s a free motion quilting foot in the kit that will help!!! Love your pumpkins. We have one end of our huge garden full of different varieties of pumpkins and they are from huge to small, dark orange to almost whjte. My husband decided to use all the leftover seeds from years past and I think every seed sprouted and grew and produced!! He keeps piling a pumpkin from each variety on each side of the doorway. I love your pumpkin and I can envision it in all shades of cream to deep red orange with a deep brown background. Thank you for your efforts to make all of us happy crafters!! Great pumpkin pattern, will start it today !! Would love to win , and try some free motion quilting !, Tthanks for the giveaway. Canadian Thanksgiving today. Love the pumpkins. These pumpkin blocks are going to be great fun to make. Love the pumpkins. Makes me want to make a table runner. I love the white pumpkin a lot. We just went pumpkin picking with grandchildren this weekend. They had a lot of white pumpkins. I love fall colors, also. 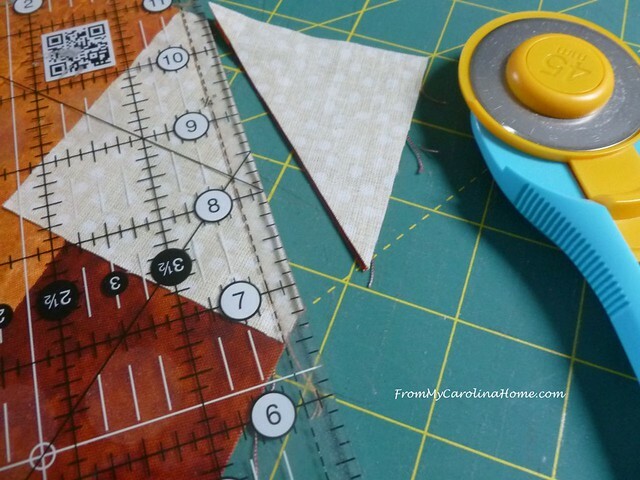 Would love to have a ruler foot and learn to use rulers for FM quilting! I love using my fall fabrics, so I may just have to add this QAL to my list. Great block! I think I’ll try to adjust it a tad so I can use 10″ squares instead of 10.5″ strips. I’d like to have a foot that transitions from denim to cotton sewn together. I used to have a Jean-a-ma-Jig but even that required manual manipulation. Thanks for the QAL and the prize opportunities! Love the pumpkin block and have been buying orangey fabrics lately-now I know what to do with them! I could use another 1/4″ foot as I am always losing mine! The pumpkin block is very fun. I can see making some in various pumpkin color shades for a table runner. I would like a foot to guide an accurate 1/4″ seam. The foot I have tends to snag the fabric, not good! I would like to get a new walking foot. The one i have doesn’t have a good edge to sew on bindings. thanks for the chance to win. Beautiful pumpkin blocks and great tutorial too! I love the Autumn Jubilee quilt along! And could not even get any better then some pumpkins to start off Autumn Jubilee and maybe some white pumpkins too boot! My favorite presser foot is my 1/4″. Thank you again for hosting Autumn Jubilee. Thank you for the fun pumpkin block. I love pumpkins too! The machine foot collection looks interesting. I just watched a video using a foot for attaching bindings by machine. I’ll have to think about this for utility quilts. I love this block! 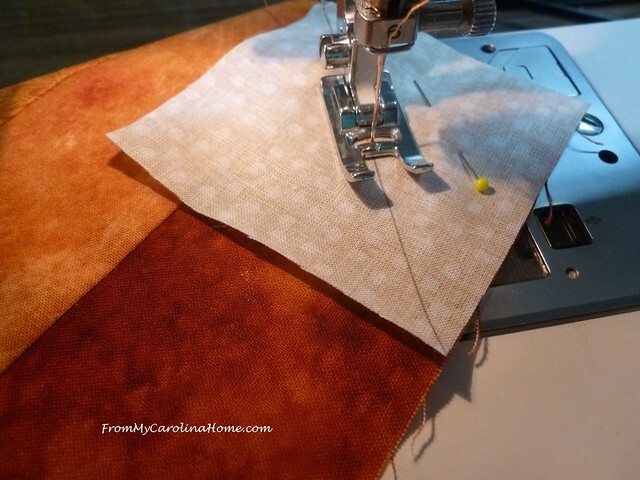 This project is perfect…I need an autumn table runner. Thank, Carole. I need a walking foot. Don’t know how I got to this site, but love the pumpkin block. A new project in my favorite colors. Woo! Hoo! Am looking forward to getting started. Neat post, this looks like a fun sew along. Always glad to find other Carolina quilters! I hope there’s a special foot to help with applying binding on quilts. That’s what I’d like to try. Love the pumpkins too and will definitely make some. Thanks! Love the pumpkin block! I need a quarter inch foot to help piece accuracy. Thank you for all your wonderful inspiration. Your pumpkin blocks are great. I am going to a guild quilt retreat at the end of the month, and these would be fun to make there. THANKS for sharing with us. I love your pumpkin. I really need a new walking foot. Mine is broken. I love Autumn and Autumn colors. I’m excited to get to the fabric store and pick out some fabric for this pumpkin! Since retirement I have been looking for projects to do. I haven’t quilted in years and looking forward to this. Thank you for the quilt along. 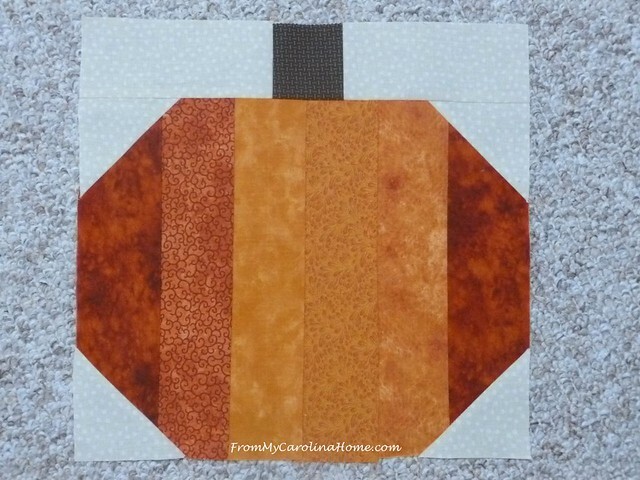 I like the pumpkin block, I have a stash of fabrics to make a fall quilt with. I am interested in seeing how the bias binding foot works. There are so many great feet to try in that box! Oh goody! A nice BIG block! LOL I have been working with some small blocks lately and it takes forever to see any progress. I love pumpkins so this is a doubly nice thing. As for sewing machine feet. . . . . I love a nice 1/4″ foot. I may have just enough orange and gold to make a table topper, and this looks like my speed at the moment! I am agog looking at that box of feet! I have immediate use for the piping foot, the darning foot, an invisible zipper foot, bias foot…I haven’t seen most of these since opening up my Grandma’s Necchi. Fall bounty indeed! Thank you for a great tutorial. Very easy to follow. I’ve been wanting to make a pumpkin quilt. Thanks for the inspiration! Hello Carole, There is no way I can resist this quilt along with you! I was just looking at all of my oranges and browns last night for some tea towels I am going to be making. I must get started right away and spend the day getting these done. So, thank you for creating another fun and I know beautiful quilt for us. Have a splendid day! OOPS…I did not do this commenting the correct way. I am not totally positive, but believe my pumpkin blocks will be a mixture of Oranges with some brown oranges thrown in if they look and blend correctly. As for the foot I would want the most, I am not positive…maybe the 1/4 inch foot. So many quilters rave about what a difference it makes. Yet, I have also wanted a ruffle foot for quite a long time also. I would absolutely love to win this prize! Thank you for doing all of your special before hand work to make this all possible Carole! You are a Special and Magnificent Blogger!!! I like that white pumpkin–makes me think of “Midnight in the Pumpkin Patch”. That is a lovely assortment of sewing machine feet. I’m not sure what they all do; the one I use most is the 1/4” foot for quilting and the all-purpose foot for regular sewing. I’m not crazy about the zipper foot that came with my machine, so a new one would be lovely! 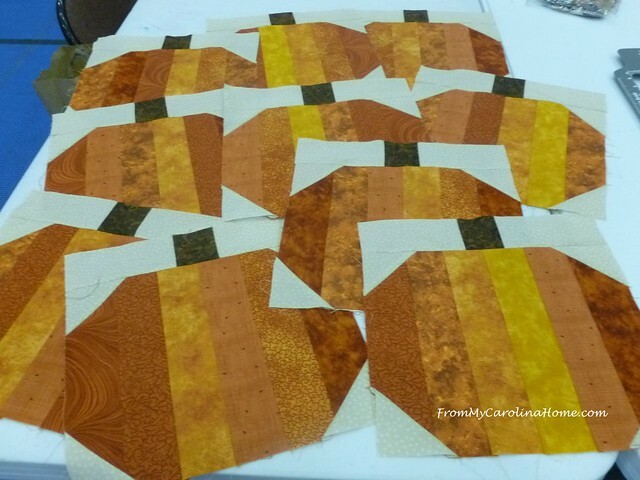 Have all my orange strips cut for the darling pumpkin blocks, but the darn background has stopped me till I get to the store. Thank you, Carole, for this fun Autumn Jubilee celebration! I’ve made small blocks like this in red for apples, but I like the larger pumpkin blocks because, well, pumpkins are bigger and would make a project quicker! I do like an open toe foot for machine applique. Those pumpkins are so cute, love them. Excited for the next block. Love your Autumn Jubilee Quilt-Alongs. You give us lots of options – small, medium & large!! I hope to spend some time in my sewing cave looking for pumpkin colors! 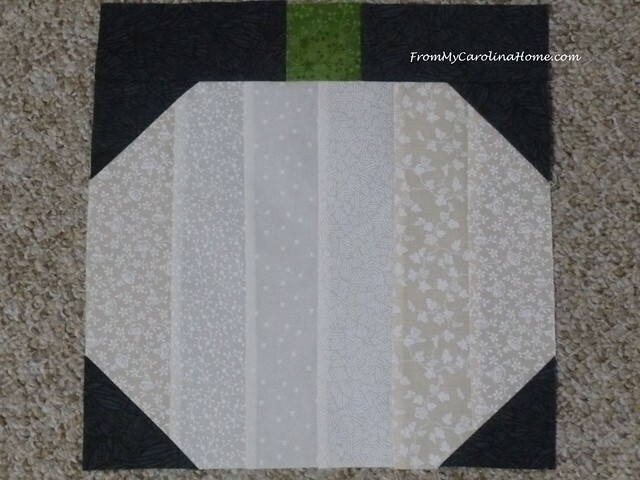 What a fun block for the fall! I do tend to like traditional fall colors but the white pumpkin with the black background is elegant. Thanks for putting this together for us. My quarter inch foot could sure use a replacement/upgrade. The more toys the better. I think I’d like a quilting foot, since lately, I’ve been trying my hand at machine quilting. The oranges or the pumpkin look great, and so do the white ones. Maybe a combination would look great. The pumpkin block is too sweet. Really enjoying your blog and the giveaway is great! Thanks for introducing is to Madame Sew. Love the pumpkins! Can see applicaying eyes, nose, mouths for fun kids quilt or wall hanging for classroom. All those cool feet! Madame Sew rocks! I’ve been collecting orange fabric because I have pumpkins on the brain! I made one and I’m working on a wall hanging that has a pumpkin, kitty and some leaves. I bought way to much orange fabric so I can make your blocks too! Your pumpkin block is perfect! Those feet and case are sweet! I think the first one I would try is the stitch in the ditch one…I can’t seem to keep my stitches in the ditches!!!! I love the traditional colors of pumpkins, yet orange is not a favorite color. Whodathunk? But I love pumpkins mixed with all the other colors of fall, greens, browns, golds, so guess those bright oranges play nicely to brighten things up, and fall is definitely a bright and colorful season. Interesting assortment of feet! I do have basics, so I think a nice quarter inch foot would be helpful and lessen the concentration factor while sewing. Looking forward to this mystery quilt pattern! 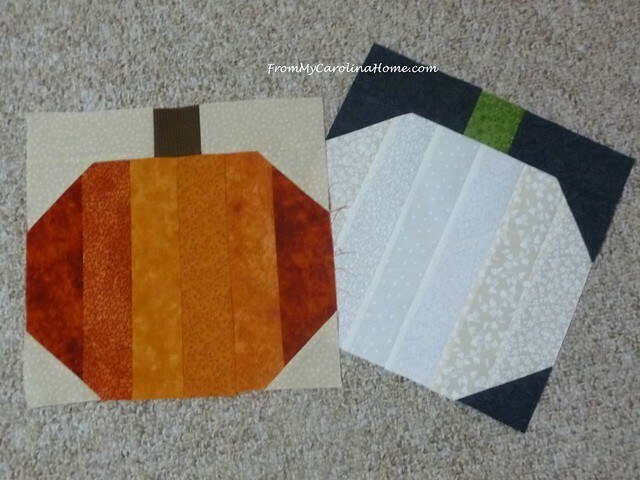 I really love the pumpkin block, and will be sewing some of them for sure. I really want to try a rolling foot. ‘Sounds very useful. Love the pumpkins, I need a fall quilt. Thanks for the great giveaway, too. I love pumpkin blocks! The foot I need the most is an applique foot. I bought one a while ago only to find that it doesn’t work with my machine. Frustrating! Thanks! Love the pumpkin blocks so cute. The sewing feet are awesome how do you decide which one to use as they are all looking fun to me. The set comes with a DVD so you’ll know how to use each one!! White pumpkins seem to be appearing everywhere. I could use a ruffler foot. We’re home from a vacation, so I’m ready to get sewing on some pumpkins! I did just post about your Autumn Jubilee series, too. Thanks for sharing all of this with your readers! I have not made any pumpkin blocks in ages. Maybe it’s time.? !! Hmmmm. Thanks for the chance at such a great prize. i love all things pumpkin; pies, muffins, bread, and quilt blocks. I love the autumn colors. I have blocks for NC flood victim please send address to mail, thanks. Please just hold onto them for now, my studio is covered up in Autumn Jubilee, and I still do not have all the arrangements made. I’ll give addresses in early November. The need will go on for a year or more, so we have plenty of time. Flood waters may rise again this week due to the hurricane Michael, too. The assessment of need hasn’t really even begun yet. Love the new pumpkin Quilt Along, thanks for making it posiible ! Looks like all the feet you would ever want. Really like the pumpkin block! Love all of your quilt articles. Pumpkin blocks certainly say fall. Madame Sew is a new sewing resource for me. I am most interested in the Invisible Zipper foot. Carole, thank you for all the work you put into the blog, and for heading up the Quilts for Carolina. The pumpkin block is great! I could use a new walking foot. I love the look of this pumpkin block!! Looking forward to making it when I finish the current 2 projects I have going. I can’t say I have a particular foot that I really need, but would love to play with different feet!! I love your block!! I am so ready to make something for fall…I love this season!! Thanks so much!! Block B coming on Monday! I was so busy getting ready for my trip, I don’t even know if I stopped by and commented on this! Thanks for a great pumpkin pattern. I’ve seen some white pumpkins lately! I don’t know how I missed this, but I’m heading to the fabric store today! 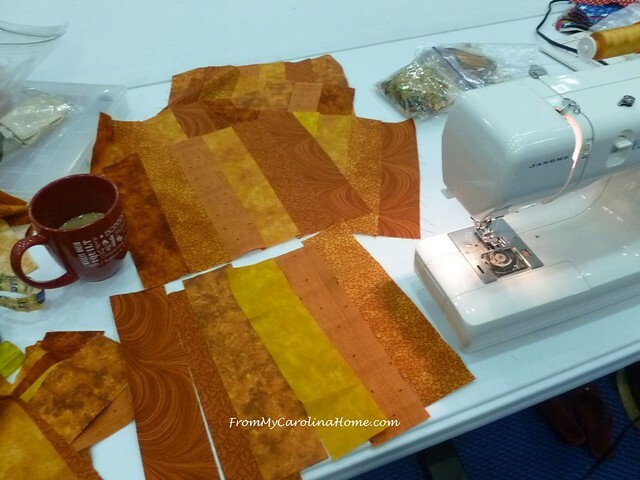 I love autumn colors, pumpkins, and quilting! Thanks for the patterns and ideas.